Michael S. Lawson is the Senior Professor of Educational Ministries and Leadership, as well as coordinator of the Doctor of Educational Ministries degree at Dallas Theological Seminary. Lawson holds a BBA from the University of North Texas, ThM from Dallas Theological Seminary, and PhD from Oklahoma University. He is the author and contributor to a number of books devoted to Christian education, including, The Christian Educator’s Handbook on Children’s Ministry (Baker, 1998), The Christian Educator’s Handbook on Teaching (Baker, 2000), and the Evangelical Dictionary of Christian Education (Baker Academic, 2001). Lawson has also written numerous articles in Christian Educators of the 20th Century, Christian Education Journal, and Christian Education Today. Most recently, in The Professor’s Puzzle: Teaching in Christain Academics, Lawson has brought together several decades of his experience and practice within the realm of Christian higher education, and has yielded a handbook that is accessible and trustworthy for the new and aspiring educator. As a current educator within the local church and an aspiring professor within the walls of the seminary, I greatly appreciate the wisdom discovered in The Professor’s Puzzle. Lawson is clear and articulate in his explanation and expectation of the reader. He knows his targeted audience well and this reality saturates every page. I am also extremely grateful for the candor Lawson brings to the discussion as he addresses difficult and pressing issues within the future/present situation of the reader. It would be difficult for me within the space provided to highlight all that I found valuable within The Professor’s Puzzle, but two things must be mentioned for the sake of this review. First, the opening chapter “A Philosophy for Christian Academic Education” is likely the most comprehensive and concise articulation of the necessity of Christian higher education I have ever read. If you could only read one chapter, please, read this one. Second, while mastery of all the chapters would be recommended with time, I was particularly challenged within my current role as a Director of Adult Education to focus upon and master my relating skills (ch. 9). The guidance given to the reader in this section is truly seasoned with salt and will beneficial to all Christian educators. 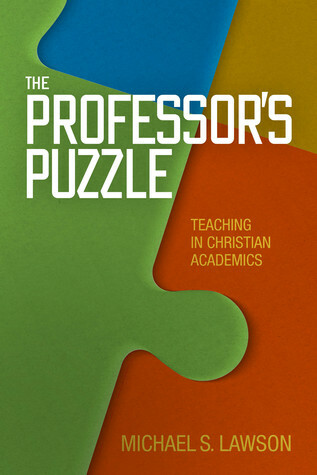 The Professor’s Puzzle is the closest most will get to having a seasoned expert guide them through the difficult waters of all things “professorhood.” Lawson provides the reader with a lifetime of experience teaching within the arena of Christian academic circles. If you are a new and/or aspiring professor like myself, this book is an indispensable tool that will be referenced often. Still, I wouldn’t limit the usefulness of this book to the aspiring academics alone. If you are a Christian educator of any kind this book will prove itself beneficial over and over again. I couldn’t recommend it more. I received this book for free from B&H Academic in exchange for an honest review. I was not required to write a positive review. The opinions I have expressed are my own. I am disclosing this in accordance with the Federal Trade Commission’s 16 CFR, Part 255 : “Guides Concerning the Use of Endorsements and Testimonials in Advertising.